Thank you for your interest in the ASA-100 Accreditation program. After your application is complete, you will be contacted to schedule your audit and provide additional accreditation information. Prior to the audit, you will be required to provide ASA with a copy of your Quality Manual. You can submit a hard copy of your QM directly to ASA, or email an electronic copy to accreditation@aviationsuppliers.org. 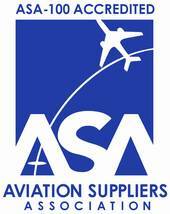 For companies renewing their ASA-100 Accreditation. Please click on the link above to renew. Be sure to log-in before completing the form in order to receive the correct reaccreditation fee.